Today’s Chilli Potato Eating Challenge is going to be a CRAZY Spicy Chilli Potato Eating Competition. So watch the full eating competition and enjoy Spicy Chilli Potato food Challenge Video. 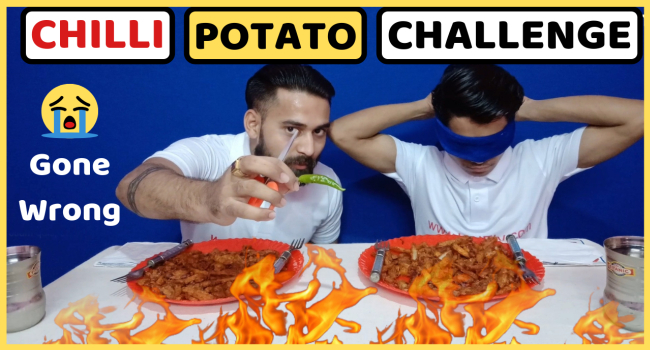 Hello Friends, In this video, Me (Ashish) and My Big Brother (Ankur) are trying to entertain you by Crazy Spicy Chilli Potato Eating Challenge. Hope you will Like & Share this Chilli Potato Eating competition. KEEP WATCHING FULL Competition FOR Crazy, EXTRA SPICY BlindFold Punishment.